A whole new range of web-based tools and services now provides learners with the opportunity to create their own digital learning materials, personal learning environments, and social networks. What are the implications for the design of learning materials, workplace training, and accreditation of learners? This chapter focuses on integrating educational principles of virtual learning with the application of these new technologies. The argument is made that these tools provide an opportunity for new design models for education and training that will better prepare citizens and workers for a knowledge-based society. It rejects, though, the notion that these tools of themselves will revolutionize education and make formal institutions redundant. Downes argues that so far, the mainstream education system has either tried to ban these tools outright, or has tried to do what traditional educators have always done with technology, namely incorporate them into a classroom-based environment. Although agreeing in many ways with Downes’ position and arguments, this chapter recognizes the diversity of approaches to teaching and learning, and therefore offers an approach to the use of Web 2.0 tools that focuses on choice for both teachers and learners. The argument is made that these tools could facilitate new models of design for education and training that will better prepare citizens and workers for a knowledge-based society. The chapter rejects, however, the notion that the tools of themselves will revolutionize education and make formal institutions redundant, because many learners require structure and guidance. Furthermore, whatever organizational arrangements are made (or not made) to support learning, these new technologies need to be integrated with a variety of educational approaches if all learners are to be accommodated. Web 2.0 is a neat term, reflecting a new version of the Web in the language of computer science. However, although the term describes new technologies that have emerged over the last few years, “Web 2.0” reflects as much a social as a technological development. 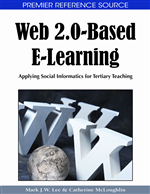 At the same time, Web 2.0 has been given an educational twist, through the parallel term “E-learning 2.0” (Downes, 2005), which involves e-learning based on Web 2.0 tools. Therefore in this chapter, while addressing some of the social philosophy implicit in many discussions of Web 2.0, the focus is primarily on the educational functionality and implications of these new tools, and an attempt is made to situate them not only in a socio-philosophical context, but also in the context of economic development, and educational theory and practice. While the terms “Web 2.0” and “E-learning 2.0” suggest a clean break from earlier applications of the Web, in education the differences, although significant, are due more to a gradual development and evolution of tools and teaching practice than a sudden “big bang.” Indeed, there is cause for concern that the term “Web 2.0” has been hijacked to describe one particular application of second-generation web tools, while excluding other new web tools equally of value to education. Thus some understanding of the history of the application of information and communications technologies (ICTs) in education is important in order to provide the necessary context for understanding Web 2.0 in education.